Please take the time to read & answer this at your own convenient pace. Is this even the right way to put this? Do you think this post better belongs in the Physics or Philosophy forums? This must be part of the old philosophical question of whether you see the same colors as I do. This is a simple question really, but the description may get a bit technical if your not familiar with the basics. If you find this complicated to read then I can write it more basically if you desire. It’s important to bear in mind that we shouldn’t equate or compare other animals’ senses & perceptions with our own, such as ‘modified’, ‘enhanced’, ‘dehanced’, ‘reduced’ or ‘increased’ human senses. We can form educated estimations about how the perception of other animals is through study of their nervous systems, brain & sense organ anatomies & behavioral tests, but have little way of proving how they actually experience things. The same applies to other humans, only that we have more ways of proving how other humans actually experience things because we have language, but even that’s still very subjective. It’s a basic fact that unlike shape, dimension & location, sensations are not matter & energy itself, but our brain & mind’s representation of them. For example, how do we know for sure whether other animals even perceive gradients of light as shades of black & white? It could turn out to be something totally different, even uncomparable or unimaginable for us. This is common sense when mentioned, but many people forget or aren’t aware of this basic fact to keep in mind. Nevertheless, what I’m wondering is whether the short-medium wavelength dichromats of most mammals & some humans & New World Monkeys, which have two kinds of opsins sensitive to short & medium visible EM wavelengths in constrast to having the extra opsin sensitive to long visible EM wavelength for most humans & anthropoid primates, actually see green or yellow as their primary color representating the middle EM wavelength? 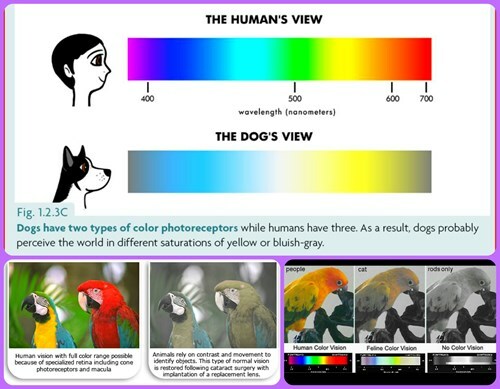 Simulations of dichromatic color vision usually portray them as seeing the primary colors blue & yellow, with the rest being combinations of those primary colors & shades of black, grey & white. In fact I’ve never come across a dichromatic simulation using green to portray the perception of the middle wavelength color for them. Its always yellow. Could it be because we’re not exactly sure whether short-medium dichromats actually see either green or yellow as their primary color for middle wavelength peak, if they even do see those colors for that matter? However, yellow is not a primary color. It may be in art & design, but it’s not in biology & physics. Yellow is the extreme end of red & green, & a mixture of red & green. 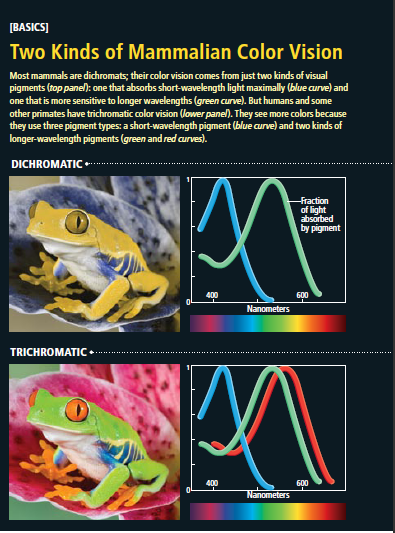 In biology & physics, red, green & blue are the primary colors. So what I’m wondering is why do simulations of dichromatic color vision portray the perception of the medium visible EM wavelengths in gradients of yellow rather than green, the actual primary color for middle visible EM wavelength, & how can we know or give the best answer to what color dichromats see as their perception of middle wavelength of Visible EM? So which color is it? Yellow or green? & is it the same for all short-medium wavelength dichromats? How would we know? If we can’t, then what is the best evidence & way to give the best educated guess? Like why is the dichromatic simulation of the frog & parrots below using yellow & blue to represent their primary colors? Wouldn’t using blue & green be more honest to biology & physics? Isn’t yellow not a primary color but the extreme end of & mixture of both red & green? 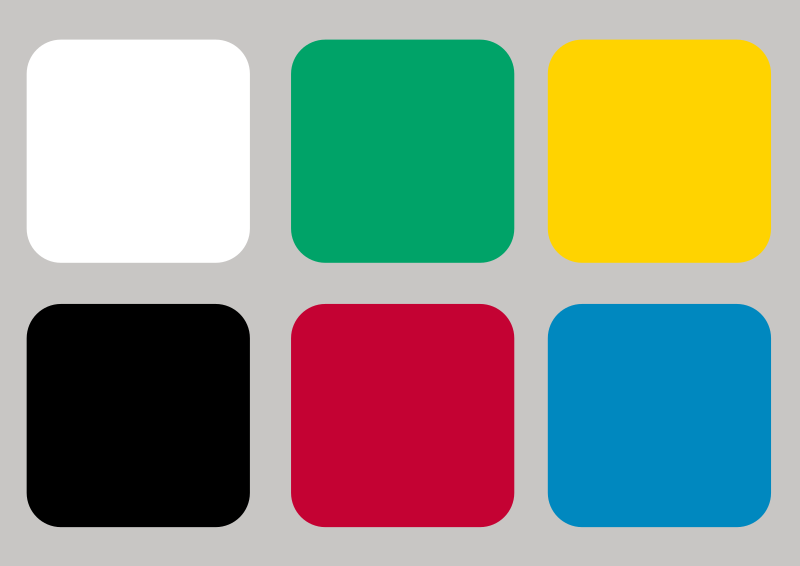 Studies have shown blue and yellow are opponent colors, as are red and green. We process the colors in opposition, as in perceiving one requires perceiving less of its opponent, equal amounts of both (minus other colors) yields no color in your final visual perception. If you cannot differentiate red and green, than the only two colors you can differentiate reliably are yellow and blue. As a side note this is also why in image processing programs these colors are on paired sliders, it is the simplest way to manipulate color images. The most common forms of color blindness in humans, and the one all non-primate mammals have prevents them from differentiating red and green. If you cannot differentiate red and green, and if I show you blue and yellow, you see no color, if I show you red and green you see yellow, becasue your blue cone is not being activated. The image below is our opponent pairs in our vision. Not the answer you're looking for? Browse other questions tagged evolution neuroscience perception psychology animal-psychology or ask your own question. If people with colorblindness lack one type of cone cells, shouldn't they be unable to recognize one particular color? Can the negative afterimage appear only if there is light or is it possible in darkness? Nature of sight/ color perception? Do some colors trigger more neural activity in human brain?